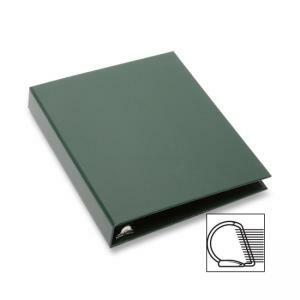 SKILCRAFT 7510-01-579-9316 Recyclable D-Ring Binder - Letter - 8.5\"
Recyclable D-ring binder features a quick-release, EZ clip ring removal system for easy recycling. Entire ring mechanism easily removes without tools to allow for full recycling of the covers separate from the rings. Professional-looking, case-bound binder utilizes extra sturdy, warp-resistant, 100 percent post-consumer recycled chipboard fully covered with coated, textured paper to resist scuffing and moisture. Outer cover is made using 30 percent post-consumer recycled content. Slant Angle D-rings are easy to open and easy to load up to 25 percent more paper than round rings and contain 70 percent post-consumer recycled content. Reinforced spine offers extra-long life. Binder is made with no volatile organic compounds, chemicals, or PVCs; only natural, healthy paper, nontoxic glue, and metal are used. 100 percent recyclable binder is made with a minimum of 73 percent post-consumer recycled material and 82 percent total recycled material measured by total weight.